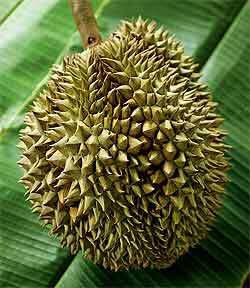 This is another popular Thai durian. The fruit is large and can reach a weight of 4 - 6kg. per fruit. The fruit is long and oval in shape and curves at the end. The thorns are brownish while the flesh is golden yellow, thick and sweet. The Mon Thong is most common and plentiful of Thailand's 30-odd species of durians. It sells for about $10 to $15 each. the flesh of Mon Thong is so custardy that it sticks to the fingers and the taste is excessively sweet. 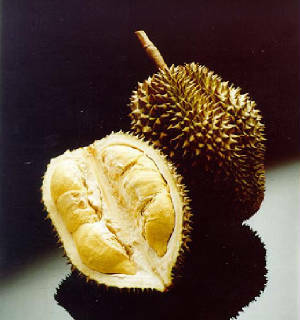 Ten researchers from Warsaw Agricultural University, in Poland, published what they claim is the first extensive study of the durian's health benefits. They found that the Mon Thong was so high in antioxidants that they suggested it be included in diets to prevent heart disease. D 159(Mon Thong, 'Golden Pillow'): The fruit weighs from 2 to 5 kg; is slightly elongated with a pointed tip. The flesh is thick, golden yellow, sweet and has a mild aroma. The edible portion is 30%. - Weight : 2.0 - 4.5 kg. - Average : 3 kg. - Average thickness : 1.25 cm.